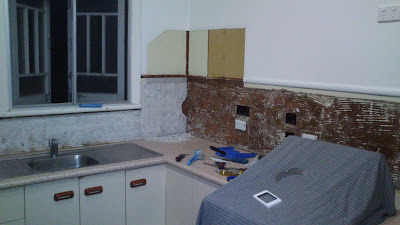 ...getting the semi-kitchen of our dreams, starting with demolition! You've probably already read about what happened with the kitchen fluro light, but if you haven't you can catch up on our lucky escape here. 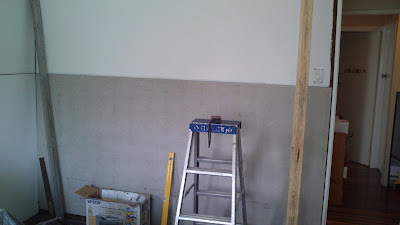 And if you have a look at this subsequent shot, you can just see the 'emergency' batten light fitting our sparkie installed so that we would still have light in the kitchen, especially handy while I continued with the wall and ceiling painting. 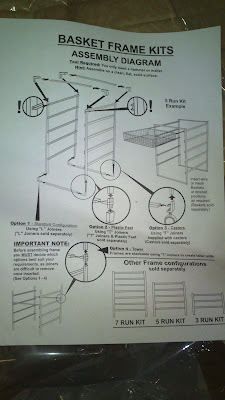 Soooo, time to tackle all those jobs and prep the kitchen one 'small' task at a time. First of all we needed to get some new power outlets (GPOs) installed - in order to move the new fridge to the right hand side of the pantry, raise the old fridge outlet to a higher position to allow a bench top to be installed, put a new outlet in and hard wire in the new stove / upright cooker, add two more in cupboard locations for the soon to be installed rangehood and slimline dishwasher. (That's right, a beautiful, little slimline dishwasher as this ol' kitchen didn't have one). At the same time as doing this electrical work we replaced every.single.lightswitch.and.powerpoint in the house so that it was standard throughout, rather than the existing blend of 1950's, 1970's and 1980's switches. Oh, and we needed to do something about the world's largest light switch. 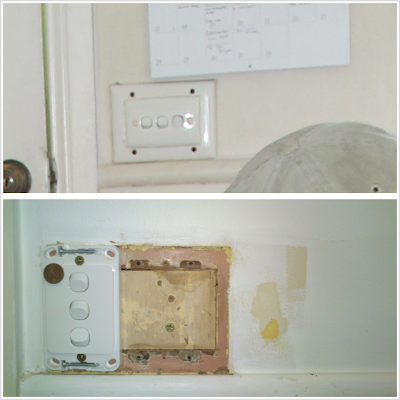 You can see it in the dodgy close up below, the second picture shows where I had to patch the wall, as the old switch had left an enormous cavity beside the new modern light switch. There's an interesting story behind the coin that is 'blu-tacked' to the front of the new light switch, but we'll cover that in detail when we do the blog post about the master bathroom renovation. But that's the limit of the sneak-peaks on offer here!! 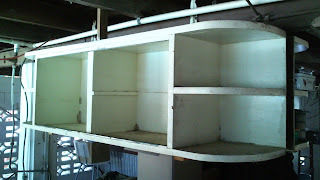 I'll cover all the dirty jobs required to prep the kitchen for its long overdue remodel, and in Part II, Kate will cover off on the design, fit-out and finishes. Having raised the powerpoint in the old fridge location (and relocated the fridge to the right of the pantry, I got busy painting the last two corner walls of the room. 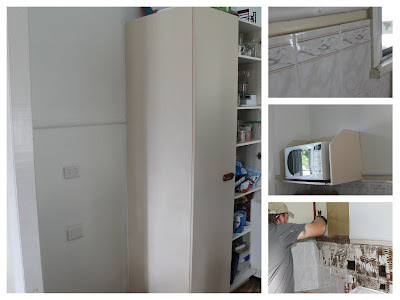 From there it was back over to the opposite corner to take down the existing microwave shelf and start the lovely task of removing the existing (once upon a time they were stylish) tiles from the kitchen splashback. Thankfully the majority came off easily, but as Murphy's Law would have it, the most stubborn ones were also the hardest ones to get to - those in the corner where the bench tops meet. 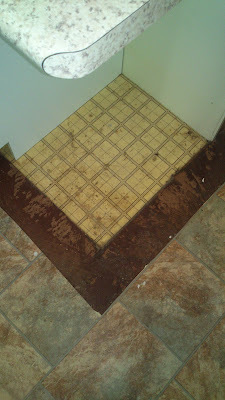 The check pattern lino is laid over the original hardwood floors, then the sub floor sheeting was laid directly over that, over which was laid the existing 'marble' type lino. One of the flooring supply shops insisted they would lay over the top of the existing flooring; I said no for a number of reasons. First of all, it would be yet another layer of flooring upon flooring, upon flooring. Secondly, there was a lot of dings and bumps in the existing lino, which would only show up again when new lino went down. Having ripped up a strip of the existing lino where a new cabinet was going to go, it immediately became obvious that the old glue had long lost its grip, and (thankfully) came up easily with the use of a Stanley knife and a dash of old fashioned muscle (yours truly). And just to rehash old ground, if you read our post about 'Basil the Rat', then you would be pleased (??) to know we found a smaller / similar nest over near the new dishwasher void once we removed that existing cabinet. So stay tuned and we'll deliver the next instalment of Our Kitchen Rules soon. This was an interesting start to the evolution of our kitchen. As time is money I wanted to get some of the kick boards off so that I could pull up the existing vinyl flooring (lino as we commonly call it in Australia), so that my cabinet maker could get straight to work when he arrived. 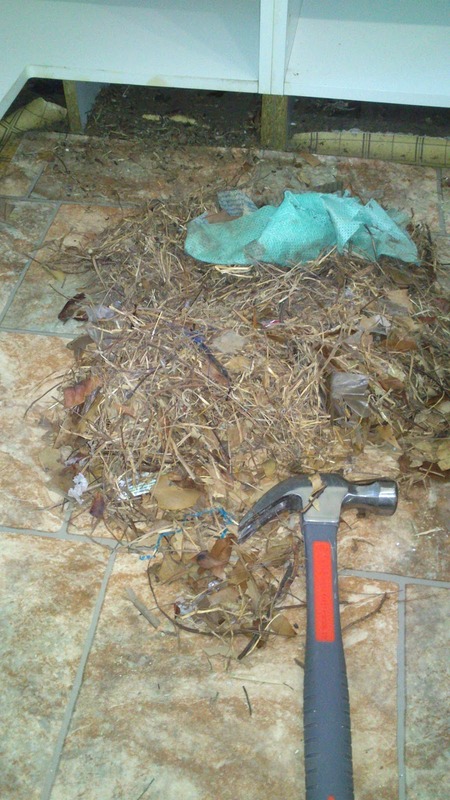 Being a little dubious about why all these leaves were under my kitchen cupboard, I suited up with gloves, dust mask and eye protection and prepared myself to find out exactly what called this little space 'home'. Slightly suspicious that it may have been a nest of some description, I armed myself with a trusty carpenter's hammer and started to drag out the leaves, while Kate stood firmly behind me with a can of 'All insects must die' spray in case we unleashed the insect's version of 'The 300'. 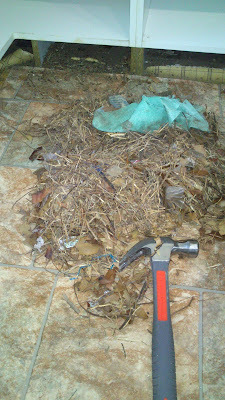 We pulled out quite an amount of leaves, as this photo shows (they actually completely filled the box by the end). I instead took him outside with the rest of his belongings, had a quick minutes silence in his memory, then turned back towards the house and set about getting the kitchen ready for it's remodel - not to mention finding out how 'Basil' had made his way into the land of Sunshine and Paint Pots :o) Note - Sasha was just leaving the house for school and as she closed the door she shouted back, "I have the title of your next blog post, tragedy... under the kitchen sink" so a huge thanks goes to her for this post inspiration! As a further digression (or confession), we have been very busy getting a lot of the renovation work done as soon as we arrived back from America, and this came at a cost of how frequently we have been able to post updates on the blog. Our immediate priority was to get the work done before I started studying again. Beginning late May I have recommenced full time postgrad studies in finance, and Kate has taken on the role of Chief Renovator, and hopefully between us we will be able to get more blog posts done more frequently. 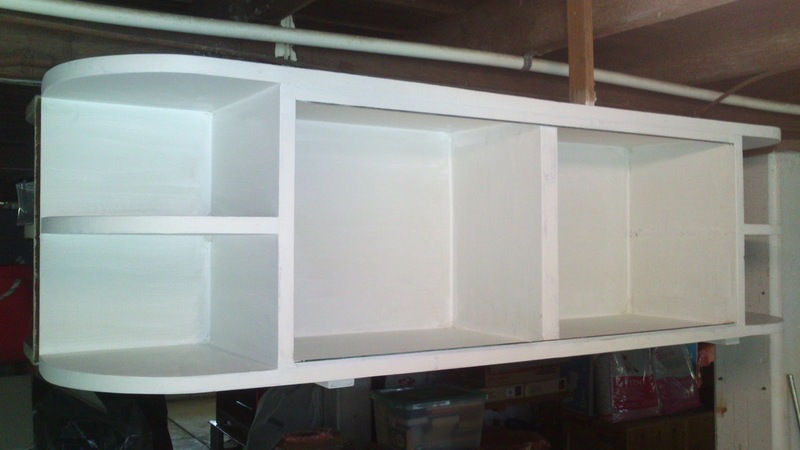 Coming up next is the actual kitchen remodel, Part I.
P.S. A big shout out to the first official follower of our blog 'Brismod' - who has her own renovation blog called 'fun and vjs' - which was (and remains) a source of inspiration and ideas for us while we were planning our upcoming renovation from America. Welcome aboard and thank you ! ...they will fill it !! Storage, storage, storage - one of the most important functional aspects for a home that most people will value after location, location, location. But unfortunately old Queenslander homes, bless their cotton socks (or white concrete stumps in this case), aren't really known for oodles and oodles of storage space. Traditionally they are empty rooms with storage provided by wardrobes, dressers, tall boys and bedside cabinets; but certainly nothing like the integrated masses of built in storage you find in modern homes. The master bedroom's built in robes were the product of a bit of old fashioned home carpentry many moons ago and as a result they were not structurally very sound, were a bit smelly, and the lower wall panel (which backs onto the master bathroom) looked like it had some evidence of earlier water damage. 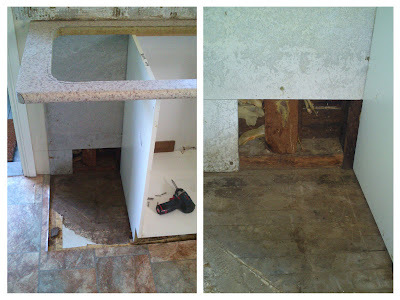 So, given that we were conducting a renovation of the master bathroom, it made sense to get in there, gut the existing cupboards and replace it with a custom made floor to ceiling built in robe, built by our chippie Nick-Nack...with a little help from yours truly! We painted the inside of the robes when we first moved in, purely as a temporary measure because we both refused to put anything inside it until it was done! You can see in the picture above the four different colours the room has been over the years. The yellowy-creamy on the left hand side, the green colour on the back wall, the light cream between the door frame and the side of where the cupboards used to be and then the band at the top right above the door (and of course the back wall) which is the new fresh bright white paint we have been using throughout the house so far. If you look closely at the bottom of the cupboard, between the kick board and the hardwood flooring, you can see slivers of the 1970's fluro orange shag pile carpet that the built ins were sat directly on top of. Nice...BUT even when it's not to your taste it is still so lovely to see the history of a place unfold before your eyes. Once the water damaged wall of the built in was removed, we suddenly had an impromptu large scale window to the bathroom renovations, (given the sheeting on the other side was removed as well, more on that in our master bath post coming soon). Given that I was getting extremely irritated by Kate moaning about the possibility of spiders casually scurrying up through open drain holes and into our room unable to sleep in this new expansive space, I put a drop sheet up to provide the illusion of a wall... happy days !! It was now time to get the experts in, namely our chippie Nick-Nack to whip us up a custom made floor to ceiling built in robe, that would fit in with the existing carpentry and joinery and not look like some poorly executed add-on. Another reason for using a professional for some jobs, is that they are tooled up to deal with many of the little challenges that houses throw at you during renovations, and they can solve them quicker than the hours/days/weeks it would take you to fix... One of the challenges a post war Queenslander regularly throws up is that the house was hand built using silky oak in the frames and trusses. 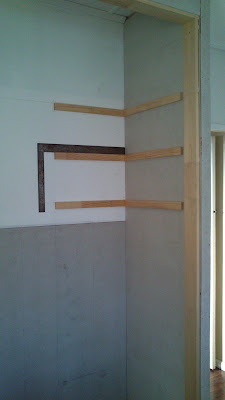 Hand built means hand sawn and hand nailed timber, and not necessarily many completely straight lines or right angles. The years of experience our chippie has in working with these old houses has been an immense help, not to mention the quality of work he delivers. 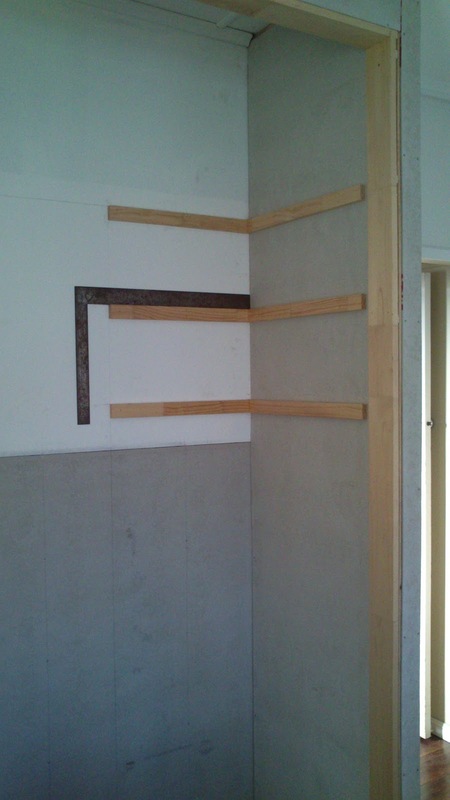 The first step in the process was to resheet the wall frame with Villaboard cement sheeting, this was used both sides of the frame as it is suitable for use in a wet area. 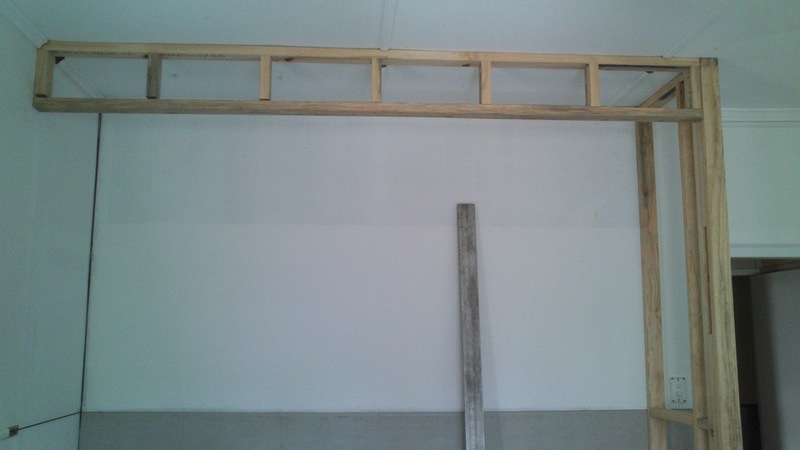 The next step was to build the frame which would house the walls of the built in robes and support the upper track of the new sliding doors. Next we sheeted the exterior and interior of the frame with Villaboard, then fitted the bearers to hold the internal shelves. 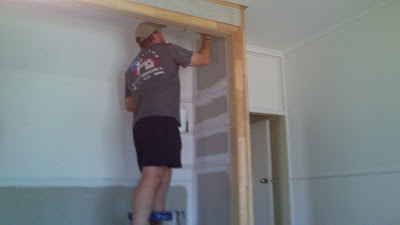 It was now time for all the trim to be fitted to the facing of the built ins, so that it all tied in with existing cornices / crown moulding, making the addition fit in properly to the rest of the room, like it has been there since day one. From here things progressed at a frantic pace, with Nick-Nack doing all the detailed work to get the melamine timber fit out installed. Again, all cut to size on site and installed with care. Once it was all put together it looked totally awesome and created far more space and functional storage than the original cupboard gave us. 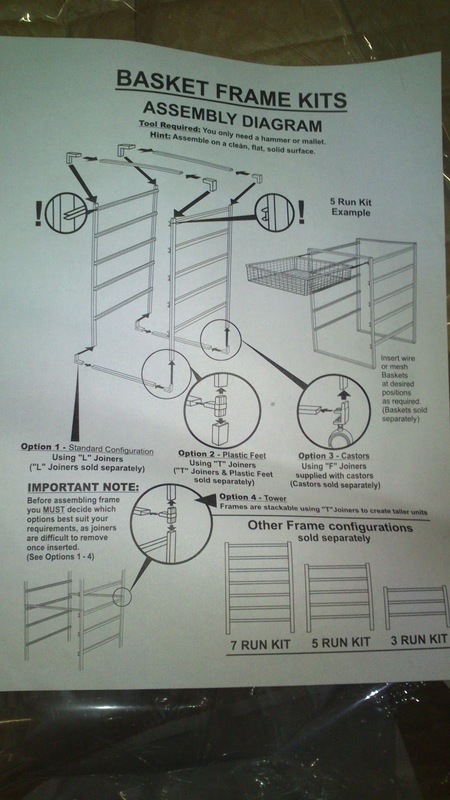 The last step was obviously to get some sliding doors added. 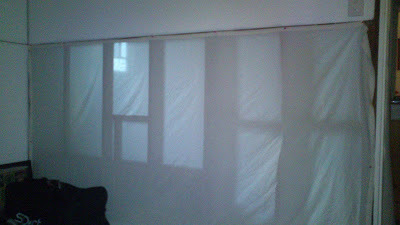 These were being custom made by our glazier/fly screen/shower glass expert Rusty, essentially to hide all the 'stuff' that was about to be piled neatly folded and placed inside. This is quite possibly the worst photo ever, but for now it gives you an idea. All in all, even though it is just a small part of a house, this was a huge change for our home as it has provided much needed storage in our bedroom, thus making the space more user friendly and ultimately neater and tidier. 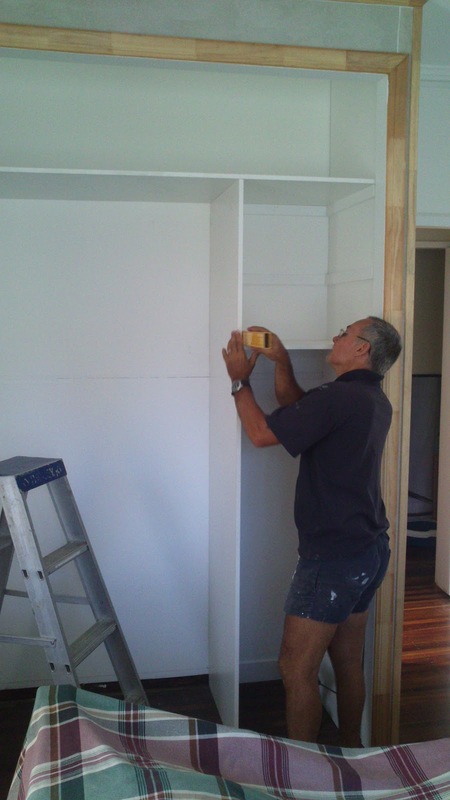 We are lucky that the room is on the bigger side (in Queenslander terms) and having the built in robe in place is a huge advantage. It is already full (meaning we don't have to sort through boxes and suitcases every.single.day for clothes), and we are both extremely happy with it. 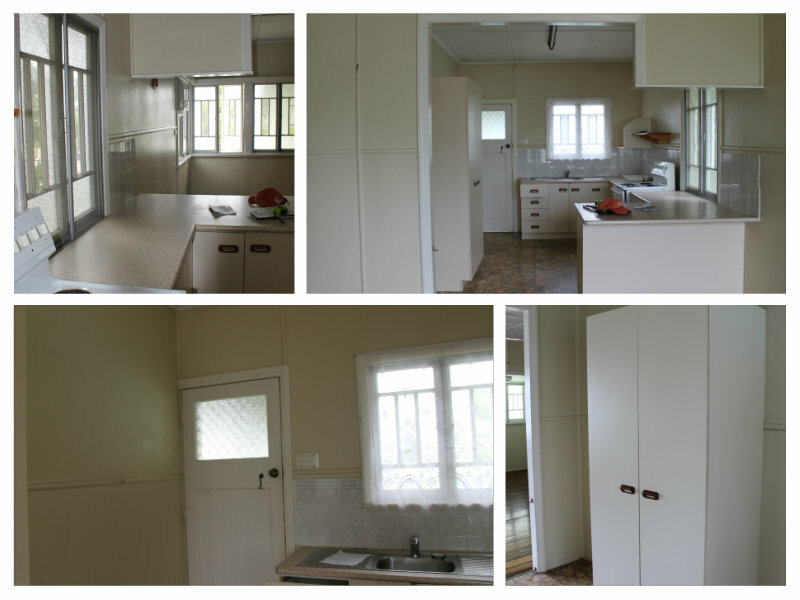 This is one of the less 'amazing' renovation makeovers you will see on our site but it is also one of the most needed. 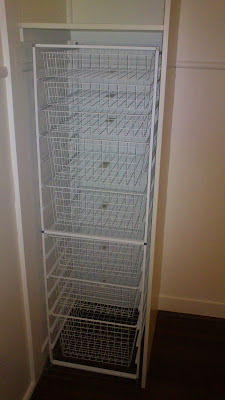 The start of our Queenslander laundry refresh. 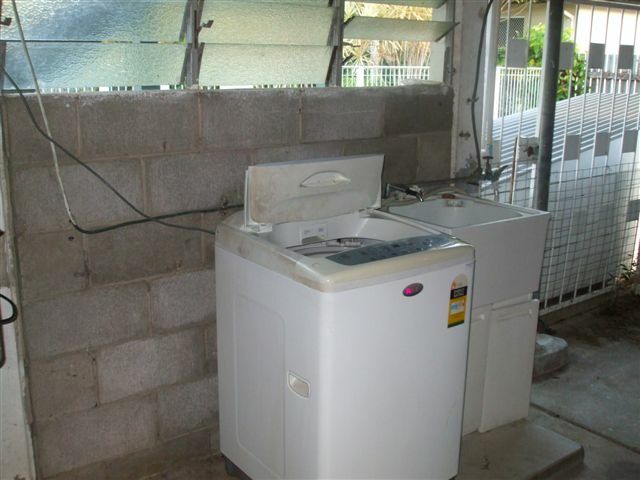 For those of you who have never lived in nor visited a traditional Queenslander home, you often won't see a laundry on the main floor plan. Why? Well invariably they are located under the house. 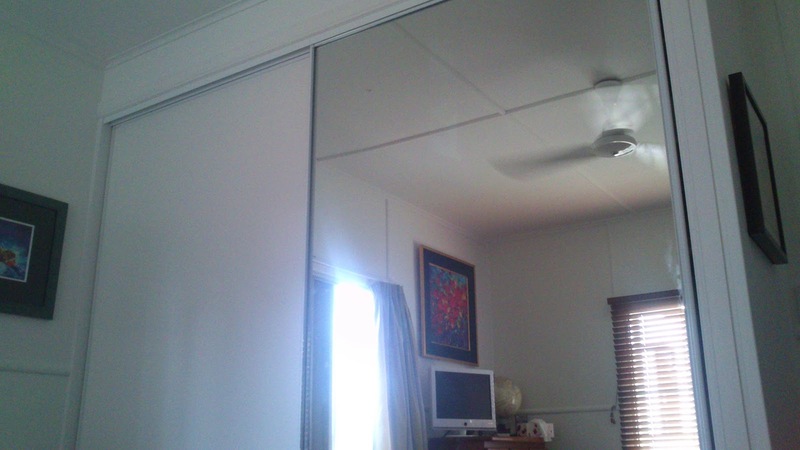 Queenslander homes are usually elevated on either timber or concrete stumps, normally placing the house floor level around six feet above the ground (allowing airflow under the house to keep the house naturally cool and to act as a natural barrier to localise flooding in high tropical rainfall areas). All that space under the house....Hmmm....I know what you're thinking folks; "woo-hoo instant man cave!!" But be that as it may gents (great place to store tools, lawn mover & beer fridge), long before man caves were invented, someone came up with the idea to locate the laundry in this underutilised space under the house. 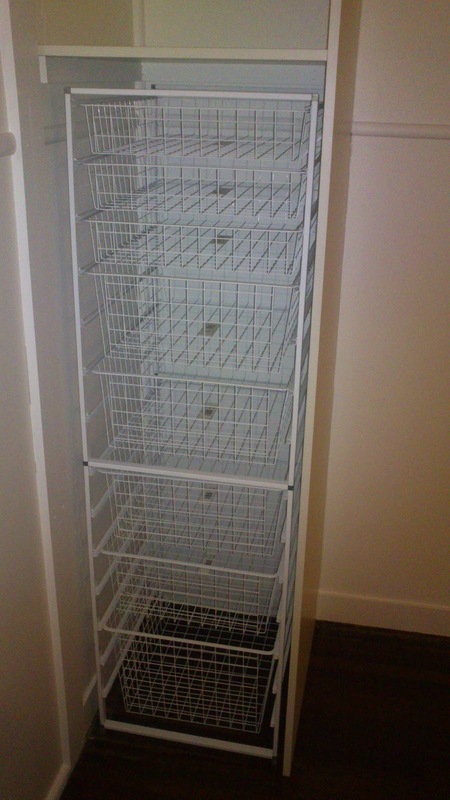 And if we think back to the heritage of Queenslander homes, this made sense in a time when twin matching front loaders that could fit in one cupboard hadn't been invented yet. We're talking about the good ol' days of cast concrete tubs for hand washing and maybe if you were lucky a new washing machine complete with twin rollers for wringing the water out of the clothes. As time has progressed, along with laundry design and appliance improvements, the humble laundry for the most part has remained in this traditional location. It seems obvious - clothes go downstairs, get washed, get walked outside to the clothes line to air dry (all year round in the tropics), and in the event of a little bit of rain they just get hung up under the house. Yes - the small dryer is still there for random clothes drying emergencies. So in an effort to make this a nicer place to utilise over all, and to address some immediate safety concerns, the laundry has become an ongoing part-time project. 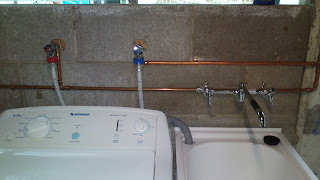 Taking our trusty plumber's advice that "if you've got me coming to do a job on the house you may as well ensure the full hour you are paying me for is completely utilised", we have been tackling the plumbing in and through the laundry in stages. The original kitchen cabinet - come laundry cabinet - gets a good clean and a new lick of paint. 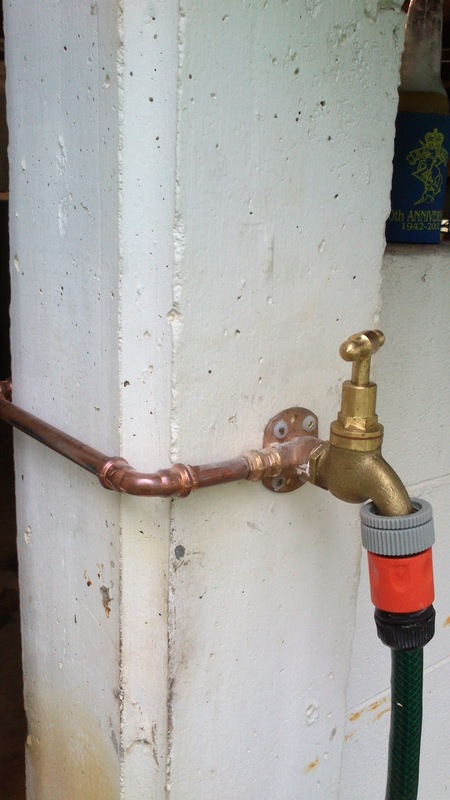 Old garden tap replaced with new brass fitting, this time securely mounted to the wall, not waving around in the breeze on the end of a length of pvc pipe! 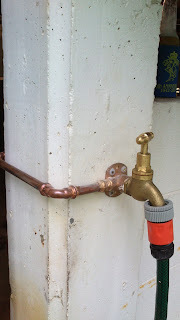 Another view of the new piping, and their are no solder marks on the copper piping as our plumber uses new brass compression fittings which not only go on quicker, but look nicer and are infinitely more reliable than solder joins or pvc pipe joins. 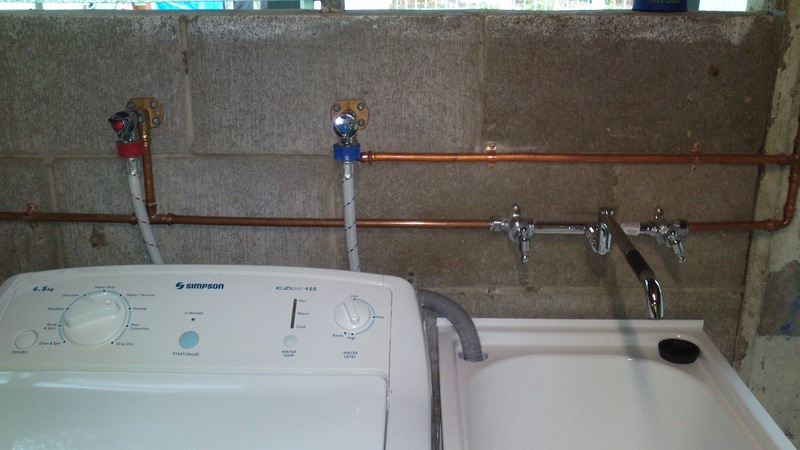 These are quarter turn taps that feed the hot and cold water to the washing machine - it's the little things that make life easier. The almost-finished-but-still-in-progress laundry 'after' shot.